A tiny exquisite art show with a mystical element is currently underway at the reinstalled Islamic Gallery at the Brooklyn Museum located at Prospect Park in New York. The exhibition continues until September 6, 2009 and contains a variety of paintings, ceramics, mosque lamps, books and a magnificent page from the Qur’an. The Sufis consider wine liquid sunlight. Through its intoxicating properties, wine provides the mystic with an alternative reality in which he or she might catch a reflection of the divine and experience a form of ecstasy. The Persian poet Hafiz (1315–1390) also compared red wine to tears of blood resulting from the suffering of the soul estranged from the beloved. 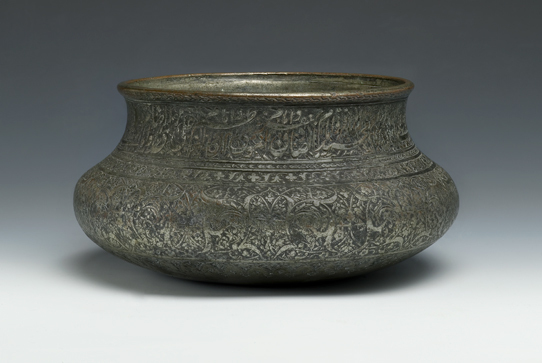 The form of this wine bowl appears to be a standard type among Iranian metal wares of the Safavid period (1501–1732). 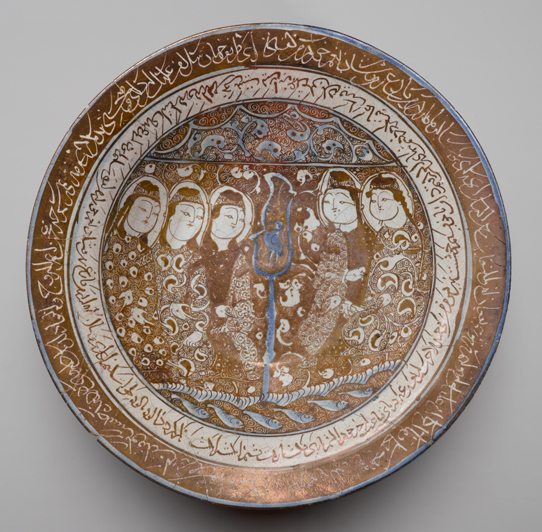 The inscriptions on such bowls, engraved in nastalīq script, tend to be in Arabic, Persian, or a combination of the two, and are often laced with mystical references. Associate Islamic Art curator Ladan Akbarnia provides a fascinating glimpse into this special exhbition called “Light of the Sufis: The Mystical Arts of Islam” and also talks about the revived Islamic Gallery in a five minute video presentation which can be seen by clicking Light of the Sufis. The video contains footage of some figurative representations, including the violent episode of the Battle of Kerbala. Ms. Akbarnia rejects the claim popularly accepted in the Muslim World that Islam is opposed to figurative representations. Among some of the items displayed are luxury versions of glass lamps found in homes which were created for mosques. A 14th-century Egyptian example, enameled, gilded and inscribed with quotations from the “Light Verse,” is in the show, on loan from the Metropolitan Museum. So is a 16th-century brass candlestick inscribed with lines in Persian about the attraction of moths to a flame, a metaphor for a soul’s ego-extinguishing passion for God. A Family of Dervishes. Possibly Antoin Sevruguin (Armenian-Georgian, 1830s–1933). Iran, late 19th–early 20th century. Silver albumen photograph. 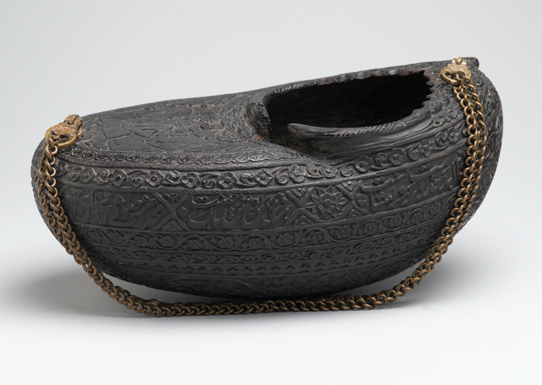 Brooklyn Museum, Purchase gift of Leona Soudavar in memory of Ahmad Soudavar, 1997.3.139. A Sufi’s attributes and clothing indicate the mystical order to which he or she belongs and may also suggest rank and status within that order. Here, the patriarch’s black robe emphasizes his authority. The varied styles of the hats further delineated positions within the group. The central seated figure holds a tabar, a small ceremonial axe, while each of the remaining men holds a walking staff, another iconic Sufi attribute. The extremely long beards of the male members identify this group as part of the Ahl-i Haqq order of Sufis, whose practices are guarded with extreme secrecy. 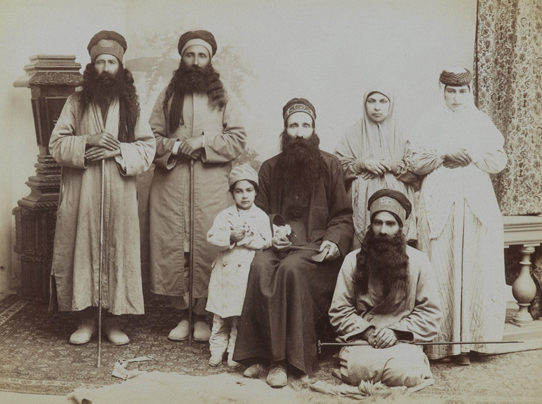 The photograph may have been taken by Antoin Sevruguin, who served at the court of the Qajar ruler Nasir al-Din Shah in the latter nineteenth century and who is known for his portraits of Iranian landscapes and subjects. A Koran page handwritten in light — that is, in gold and silver inks on a sheet of parchment dyed deep blue — is the exhibition’s oldest work, dating from the 10th or 11th century. “Seen by candlelight, the words, which describe the rewards of Paradise, would have glinted against the dark ground like constellations in a night sky,” says a New York Times review of the Koranic page. I will be among the dervishes, for all eternity, away from eternal evil. Images are Copyright, Brooklyn Museum.